Partially cook the Brussel sprouts in a large pot of boiling salted water, about 4 minutes. Drain. Meanwhile, heat the oil in a heavy large skillet over medium heat. Add pancetta and Saute until beginning to crisp, about 3 minutes. Add the garlic and saute until pale golden, about 2 minutes. 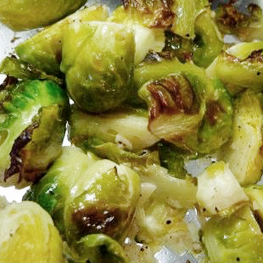 Add the Brussel sprouts to the same skillet and saute until heated though and beginning to brown, about 5 minutes. Season with salt and pepper, to taste. add the broth and simmer until the broth reduces just enough to coat the Brussels sprouts, about 3 minutes. Serve. This entry was posted in Nutriplus Recipes (Balance Your Pyramid), Vegetables and tagged brussel sprouts, easy, fast, healthy, Metabolic Medical Center Recipes, nutriplus, pancetta, side dish by foodies4mmc. Bookmark the permalink.